If you don’t have any background yet about investing, I suggest to read this first, My Maid Invest in the Stock Market by Bo Sanchez. It will give you an idea how to manage your personal finance and how to start investing. Stock market is just one of the vehicles to grow your money. Just a reminder, to use only your extra/excess cash, or your investment fund (if you already have your emergency fund) when you decided to invest. After knowing the basics of financial planning and you have decided to invest in Philippine Stock Market, your next step is open a trading account with a stock brokerage firm. There are several online stock brokerage firms in the Philippines. But in this lesson, we’ll use COL FINANCIAL GROUP as our broker of choice. Note that COL FINANCIAL GROUP is the former CITISECONLINE. Also this is a one-time procedure for account opening. The rest of your transactions can be online or via banks for your deposits. Option 1: You can complete the form online. 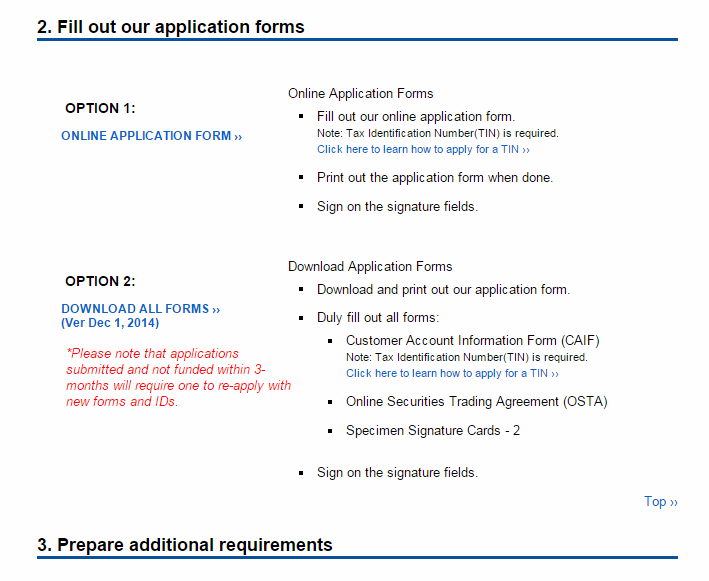 or Option 2: You can download the forms and print them out..
Let’s choose to download the forms. Click on DOWNLOAD ALL FORMS. First is the Customer Account Information (CAIF) form. Print them and duly fill them out. *Col Financial frequently update their website. (these are the application forms and requirements as of the writing). Do visit their website, www.colfinancial.com for the updated information. Make sure signature are consistent with those on ID’s submitted and across all fields. Your Tax Identification Number (TIN) is required in filling out the CAIF. If you don’t have TIN yet, click here to learn how to apply for a TIN. Photocopy of at least one valid government issued id. And for those without face-to-face opening of account. Face-to-face opening of the account means you’re personally submitting the requirements to COL Business Center. Sign twice on the photocopy of your id. Any billing statement under a relative’s name as long as it has the same address on what is written on your application form. A valid government issued id that has an address on it. If you have any questions on these requirements, just put them in comments below. Now, it’s time to submit them to COL. Here’s a tip to avoid delay. Send COL Financial scanned copies first of your application form and requirements so they can check on it before you submit the physical copies.You can send the scanned copies to HELPDESK@COLFINANCIAL.COM. Once COL confirmed that all your requirements are good, go to step 2 – submit the forms and requirements. Or you can call COL Financial and schedule it for pick up if you are within Manila Area. COL’s customer service hotline: +632 651 5888. If you’re outside the Philippines, you can send your documents via a courier. Email scanned copies first before sending the physical copies to avoid delays. Once COL received your application, wait within the next three days for your account opening approval which will be sent to your email. Now, your account only needs to be activated by funding it. Please include your Name and COL Account No. at the back. Obviously, Online Banking is the most convenient. This means you’re ready to buy your first stock! Click on this tutorial on how to make a first buy order. Any questions about this tutorial? I would love to hear from you, feel free to comment below. Subscribe to my mailing list so you won’t miss my articles. FREE Educational Resources on PSE Stock Trading! Get FREE stock analysis, special reports and brokers’ recommendations! Be a smart stock investor. Get FREE Fundamental and Technical stock analyses! Make SMART investment decisions! Be guided by top stockbrokers in the Philippines! Which PSE stocks to BUY or SELL? Find out here! Do you also want to earn P400,000? PinoyInvestor: The BEST stock resource in the Philippines!